Soldier On is a fictional story based loosely on the author, J.D. Wynne’s, experiences in the forces. Molly McKinney is the main character – I assume loosely based on J.D. She is extremely likeable and is a young, fresh soldier deployed to Afghanistan. Molly joined the forces to help her pay for her education – she hopes to become a doctor. She has to put those plans on hold while she becomes a Military Police Specialist in the middle east. Her new job is guarding suspected terrorists at Bagram airbase in Afghanistan. This books follows Molly’s life overseas, the friendships, and trials and tribulations of living and working far from home in a war zone. She makes many friends, falls in love, and discovers many things about herself and others. 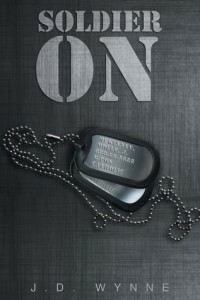 Soldier On is a great name for this book. It really applies to everything that goes on with Molly and the American Military. I was really drawn in to the story. I immediately felt Molly would be a great friend and I was eager to read about how she stayed strong in such a difficult job. The relationships between the soldiers are very believable. Soldier On explores what happens when people live in very close quarters and spend all their time together. There are lots of friendships and little bit of heartbreak – a story of soldiers is bound to have some death. But it’s all well written and captivating. I enjoyed the pace of this book. It was a smooth, easy read with compelling characters. I never felt like I had to “get through” the book. Some of the stories I’ve read definitely leave me feeling like it’s a job to read. This one wasn’t like that. I was eager to pick it up and finish it. I really did enjoy this story! Thank you Jessica. You are really doing a great thing for all the aspiring authors out there. Thank you. I enjoy reading, and it feels good to help others. I’m glad you found my review. It really was. I enjoyed it. Thanks for the comment Jayne!